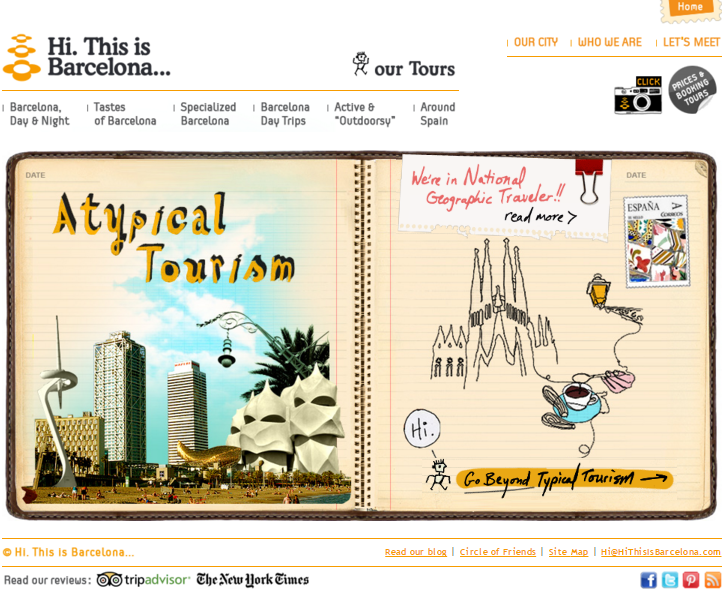 Picture the scene: you plan a long weekend trip in Barcelona. You are very excited about all of the gastronomic delights that await you. And then you realize one thing…. it’s Monday, meaning that the majority of restaurants are closed! Of course we don’t begrudge restaurateurs from having a well-deserved day of rest, but for the out of town visitor this can narrow the dining options. Below is a guide to some of our favorite spots that are open on Mondays. Note: for brunch recommendations refer to our dedicated post on the subject. This intimate, little restaurant in Eixample offers avant-guarde, molecular cooking worthy of a Michelin-star, but without the associated price tag. Although their website doesn’t give anything away, do check them out on TripAdvisor. Reservations recommended. Overlooking Plaça Sant Felip Neri, one of the most picturesque squares in the Gothic Quarter, you will find this charming boutique hotel. The restaurants offers a number of seasonal set menus, as well as tasting and a la carte options. Situated immediately next to Sant Antoni Market, Bar Ramon is an excellent choice for those looking for good quality, traditional tapas. Reservations are always necessary as it is a very popular spot. For those looking for more high-end, gourmet tapas Bar Cañete is the place for you. Sit along the bar whilst you watch the chefs prepare your food right in front of you. Reservation in advance is recommended, especially for larger groups. Nestled between Mercat del Born and Passeig Picasso you will find Big Fish, which specializes in Mediterranean and Japanese sea food. Springing from humble beginnings, Els Pescadors originally cooked the catches of local fishermen who traded their merchandise in the neighboring square. These days this restaurant could no longer be described as humble, and would fit very comfortably next to the other fine dining suggestions listed above. Within Barcelona this chain of restaurants, specializing in roasted lamb, can be found at a number of locations. Perhaps our favorite is the one located on Avenida del Tibidabo as it is set within a beautiful modernisme building. Reservations recommended for larger groups. Although not Catalan, from time to time only a good steak will do. And when it comes to steaks few do them better than the Argentines. Aside from steaks they offer homemade pastas, salads and fish options, plus an excellent range of Argentinean wines. Barcelona meets Jerusalem at this delightful vegan restaurant in Eixample. Don’t be fool by the name, they serve more than just hummus. Try their fantastic salads, pitas, falafels and shakshuka. This Nepalese café is a great spot to have a light lunch. Firm favorites include their thali and juices, all made from fresh, organic ingredients. This entry was posted in Barcelona and around, Food and Drink and tagged Barcelona, Catalan Cuisine, El Born, Exiample, Fine Dining, Fish, Japanese, Juices, Lamb, Meat feasts, Mediterranean, Modernisme, Open Mondays, Organic, Poblenou, Raval, Restaurants, Salads, Seafood, Steak, tapas, Thali, Vegan, Vegetarian. Bookmark the permalink.